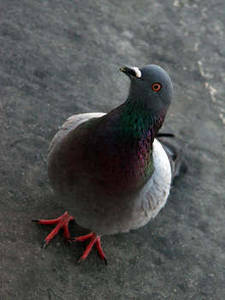 Have you ever wondered why a pigeon walks so funny? I did. So I Goggled it, of course, because, what DOESN’T Google know?? Pigeons walk so funny so they can see where they’re going. A pigeon’s eyes can’t focus as it moves, so the bird actually has to bring its head to a complete stop between steps in order to refocus. It proceeds clumsily—head forward, stop, head back, stop. So I began to notice, “Well what does a pigeon have to do with my walk with Christ?“ Then I thought, as Christians, in our spiritual walk with the Lord, we have the same problem as the pigeon: We have a hard time seeing while we’re on the go. It’s go here. Run there. Hurry back here. We rarely stop between steps—to pause and refocus on the Word and the will of God. That’s not to say we have to pray and meditate about every little decision in life. But certainly our walk with the Lord needs to have built into it a pattern of stops that enable us to see more clearly before moving on. Christ instructed us to pray even! Matthew 26:41 says, “Keep alert & pray. Otherwise, temptation will overpower you. For though the spirit is willing enough, the body is weak!” (NLT) Stopping is good. It doesn’t mean that I’m slow. It means I have sense enough to know I can’t keep going constantly without refreshing myself. Another example I found of prayer, I found in Daniel’s practice of praying three times a day. This was an essential part of his walk with God (Daniel 6:10). And prayer is especially essential to my walk with God in today’s world. Prayer develops my relationship with Him. Daniel 6:10, “Now when Daniel learned that the decree had been published, he went home to his upstairs room where the windows opened toward Jerusalem. Three times a day he got down on his knees and prayed, giving thanks to his God, just as he had done before.” Nothing stopped him. You see, Daniel knew that there’s a certain kind of spiritual refocusing that we just can’t do without stopping. In his walk, (and from his example) his stops gave him a very different kind of walk—one that was obvious to those around him. Wouldn’t it be the most wonderful-est and awesome-est event ever to know that our walk is so different from other walks of life (as it SHOULD be) & even other CHRISTIANS walks, that it becomes obvious?? So then what about us? At the risk of being thought of as different (as Daniel was) there’s quite a valuable lesson to be learned from the pigeon: “Looking good” isn’t nearly as important as “seeing well.” So instead of being so concerned about how it looks to other people to pray in public, or how often I should pray (although I can pray as often throughout the day as I please), I will “focus” my vision by just praying; stopping in my steps to refocus. Daniel’s example is an excellent one & if Daniel and Christ’s examples weren’t enough, God even used the pigeons to give insight! Prayer keeps me connected to my Father and gives me direction. It refreshes me on my journey to becoming even more BOLD and FABULOUS in/for Christ. This entry was posted in Mondays with Claire and tagged bold and fabulous, boldandfab, christ, focus, God, hurrying, Jesus, meditate, pigeons. Bookmark the permalink. As far back as I can remember, your dad prayed with you every night, holding you close as an infant and kneeling down beside you as a child. It was done to show you the importance of talking with God about your day, acknowledging His greatness; interceding for others and thanking Him for our daily bread. It’s great that you’ve continued the practice in your young adult life. Prayer is essential in the lives of all believers; it’s our daily communion with the Lord; our direct line of communication in our intimate relationship with Jesus Christ. I’m SO thankful I don’t have to build an altar; all I have to do speak; and I’m heard! Thank you Lord! Claire, it’s amazing to me how you took something so simple as a pigeon’s walk and made it relatable to me and to everyone. You’re wisdome never ceases to amaze me. At such a young age, you are so centered. Glory to God! We all need to take time to refocus on what’s important. Not getting so caught up in everything else that we don’t take the time to STOP to check in w/ GOD to make sure we are not living in our own will but His! Enought SAID!!! 2 THE KING….. Prayer is so needed in our lives today. I can not think of any greater thing that takes us in to the Throne Room and in the presences of our loving Father. Claire I am very proud of you. Stay Focus and prayed up because our foe is out to destroy our witness of a AWESOME and POWERFUL GOD and Father. I Love You. Awesome blog Claire! Way to make it plain! I can definitely relate to the need for refocusing from time to time. hey claire i really like this one and joclyn im with u wen u said she made it so simple as a pigeons walk. WOW! thats amazing.keep up the good work and continue too spread the gospel about GOD! Thank you to everybody! And I am especially encouraged now to know that this has impacted each and every one of you all. To God be the glory!! He is using me, just as I desire. To the KING!! !